John Harcher, agente retirado del DEA, descubre al regresar a casa que su antiguo barrio está plagado por la droga. El responsable es Screwface, un temible traficante contra el que Hatcher se enfrentará a muerte. 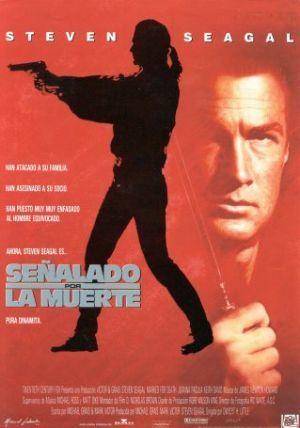 Steven Seagal, Basil Wallace, Keith David, Tom Wright, Joanna Pakula, Elizabeth Gracen, Bette Ford, Danielle Harris, Al Israel, Arlen Dean Snyder, Victor Romero Evans, Michael Ralph, Jeffrey Anderson-Gunter, Tony DiBenedetto, Kevin Dunn, Peter Jason, Danny Trejo, Richard Delmonte, Elena Sahagun, Rita Verreos, Joe Renteria, Carlos Cervantes, Wayne Montanio, Nick Corello, Grant Gelt, Justin Murphy, Earl Boen, Stanley White, Matt Levin, Philip Tanzini, Leslie Danon, Terri Ivens, Dale Harimoto, Tracey Burch, Teri Weigel, Robert Ashiva Gant Strickland, Noel L. Walcott III, Prince Ital Joe, Andria Martel, Nick Celozzi, Debby Shively, Craig Pinkard, Matt O'Toole, Kerrie Cullen, Linus Huffman, Roger Romero Godbout, Harry John Leamy, John Endeveri, Christopher Allen Goss, Libert Steer, Philip Chen, Rock Deadrick, Einstein Brown, Eric Bernard, Haile Maskel, Jimmy Cliff, Tony Williams, Richard Barr, Ansel Collins, Radcliffe Bryan, Loris Lawrence, Carol McLaughlin, Lloyd Willis, Phillip Michael White, Sandra Canning, Tom (II) Dugan. Dwight H. Little (Dirección), Ric Waite (Montaje), Mark Victor, Michael Grais (Guión), James Newton Howard (Música).